Townshend Rock 7 review | What Hi-Fi? We're going to disappoint those who like a bit of suspense and make it clear right from the start: the Townshend Rock 7 is a brilliant-sounding turntable for the money. Little we've seen at this price or a fair bit higher can match the precision and sheer transparency on offer here. That said, this deck isn't a particularly great choice for those who want a sumptuous vinyl experience. There's not much excess warmth or smoothness here. Instead, the Rock delivers pretty much whatever is on the disc, for good or for bad. That may leave some listeners underwhelmed with the worst recordings in their collection, but with most records the Rock 7's honesty is most welcome. Listen to REM's Automatic for the People and this deck delivers every sound with unerring precision. Leading edges are sharply defined and dynamic subtleties are revealed in all their glory. The result is an engaging presentation positively brimming with fine detail. Importantly, the delivery isn't sterile or overly analytical, despite the depth of information on offer. Switch music to something grander – Holst's The Planets will do – and the Rock 7 responds with enthusiasm. Scale and authority are top drawer and the deck's innate composure ensures no instrument is lost in the piece. Dynamics are as wide ranging as you like, with the deck delivering crescendos with solidity. That the Rock 7 delivers this performance with an entry-level Rega RB300 tonearm and a budget Goldring moving-magnet cartridge is testimony to its quality. Townshend's decks have never been 'me too' affairs: you only have to notice the swivelling trough that sits over the record to know that. This trough is filled with silicon fluid that damps the end of the arm, allowing the cartridge to do its job with minimal interference. You can save £500 and buy the Rock 7 without the trough, but it's much better with it. Other highlights include spring feet that are damped by air-loaded rubber bellows when subjected to large vibrations. Levelling is accomplished by a hanging weight that can be moved around to balance things out. The suspension system works rather well, with the deck far less fussy about siting than many rivals. That said, a dedicated support positioned well away from the speakers will always work best. Criticisms? Well, the Townshend deck feels well made and is mighty sturdy, but its finish lacks the professionalism of rivals such as the Linn Sondek, Michell Gyrodec and Clearaudio Performance. There's just a little too much of a 'home-made' feel about it. Additionally, the motor is separately housed and on our sample was hard to position so the belt ran quietly and smoothly. As for the trough, it may work well, but it's all too easy to drop some silicon fluid on your prized LP if you're not paying total attention. 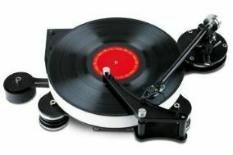 Still, there is no arguing with the fact this is an extraordinarily capable turntable for the cash. Sure, there are decks that sound livelier, and carry a rhythm track with greater verve, but when it comes to getting information off the record and presenting it in as unbiased manner as possible, the Rock 7 has little to fear from any rival.